My son gave his life on Mother's Day 2005 while conducting house-to-house searches with his unit. Insurgents opened fire with machine guns from inside the house as Dustin's fire team was opening the door. He was hit in the back by an armor-piercing round that tore through the walls of the house. Three additional members of Dustin's team were wounded during the firefight, one seriously. Members of the unit laid suppression fire as Dustin lay unconscious near the doorway. A wounded Marine carried him to safety and shortly after he was transported by helicopter to a field hospital. Dustin died in route. He was the first of 23 Marines and Navy Corpsmen killed in action during Lima Company's 7-month deployment. Many view that as his story, but the end of Dustin's life has so very little to do with his story. Dustin's story is everything that proceeded that fateful moment in the Iraqi desert. It is also what has happened since. As a Gold Star Parent, I want people to remember Dustin for who he was and how he lived. I want people to know how he is still impacting people today in ways I never dreamed possible. When people see his name I want them to know the story of a full life, not just this single chapter. Dustin was a unique young man, but was also made of the same American fabric common to many of our fallen heroes. He was all boy. He loved playing army with his GI Joes as a child while wearing his "cammies." Dustin loved playing baseball and was an excellent pitcher and catcher. He was the happiest when he was working with his hands...making something unique or fixing something broken. Dustin was not afraid of trying the impossible and pushed the envelope of life every chance. He loved his mom, his sister, his girlfriend, his step-mom, and me. He loved helping people and doing what others couldn't do or in some cases, wouldn't do. He loved his country and willingly took an oath to defend it at all cost, including his life. Most of all my Dustin loved life -- every heartbeat! Dustin wanted it all and wasn't going to compromise anything. At times he wasn't certain about where his life was taking him, but when he would calm his head and follow his heart amazing things always followed. Dustin had an uncanny ability to make you forget about your troubles and have you laughing over the craziest things when you least expected it. You could never stay mad at him. His contagious smile and dimple would melt your heart in seconds and soon you would completely forget what made you upset. I think Dustin used that trait to his advantage. His fellow Marines commented that Dustin didn't take things too seriously except on missions. They said he had a gift of making the toughest times a little easier with his laughter and antics. Virtually every picture of him in Iraq showed him smiling even though he sorely missed home, cool spring breezes, and home cooked meals. Dustin complained about the hardships but always made others forget about them through his gift of laughter. I choose to follow Dustin's example and make the most of each day. I choose not to let Dustin's story end with that scene in New Ubaydi. I tell his story and I share the lessons he has taught me, but most important I reach out in pain to comfort other Gold Star families and returning troops. In doing that my pain is always lessened. This Memorial Day or any day, when you see the name of a fallen hero, realize there is more to the story than a name and date of death. Take the time and learn about the lives of our heroes. Don't focus on their untimely ending. I promise you knowing their entire stories will enrich your own life. After all, the full measure of a life is not in way one dies but the life that was lived. Bob Derga is the Proud Father of Cpl Dustin Derga, Lima Company, 3rd Battalion, 25th Marines. Dustin was killed near the Syrian border in Iraq on Mother's Day May 8, 2005 during Operation Matador. 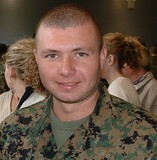 Mr. President, today I rise to pay tribute to a courageous Marine, Lance Corporal Dustin Derga of Pickerington, Ohio. Dustin was killed in Iraq while fighting insurgents on May 8, 2005, Mother's Day. After taking an interest in the military as a child, Dustin served 5 ½ years as a Marine, and Operation Iraqi Freedom was to be his final deployment. Sadly, 24-year-old Dustin died just one month short of his scheduled homecoming. He is survived by his mother, Stephanie Derga, father and stepmother,Robert and Marla Derga, sister, Kristin, and girlfriend, Kristin Earhart. A 1999 graduate of Pickerington High School, Dustin went on to attend Columbus State Community College where he pursued a degree in EMS and Fire Science. He also served his community by working as a firefighter. Nor will the rest of us forget the brave sacrifices made by these fine young men. My wife Fran and I continue to keep the family of Dustin Derga in our thoughts and prayers.